A trio of researchers at the University of Southern California has uncovered a social-network illusion that might explain why some things become popular in cyberspace while others do not. Kristina Lerman, Xiaoran Yan and Xin-Zeng Wu have written a paper describing the illusion and how it works and have posted it on the preprint server arXiv. Social networks are not new of course, they have been going on for thousands of years, if not longer—what is new is the venue and size. As they have grown online, scientists have begun studying them in earnest and have found some interesting things, one of which is the friendship paradox—where any given person's "friends" will have more friends than they have. This illusion is created by the slewing of the average by one or more friends that have a lot of friends. And it is not restricted to just friending sites, studies have shown that for the average Twitter user, their friends will Tweet more than they do, and again, it is an illusion that comes about due to slewing by just a few other users. In this new effort, the researchers have found a similar illusion, where ideas, photos or other information can appear to be much more popular than they really are. 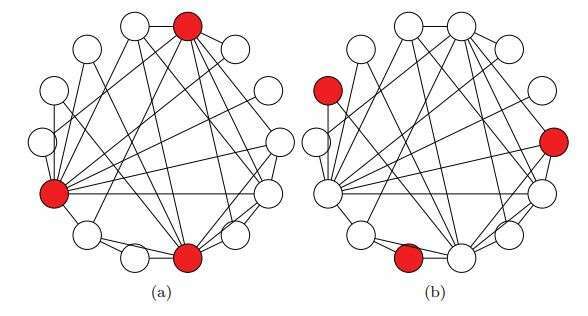 The illusion comes about, the team explains, due to just a few nodes (people) having links to a lot of others—they provide an illustration of two views of a simple 14-node network, the only difference between them is that different nodes have been colored red. In one view, nodes with multiple links have been colored, in the other, those with just a few links have been colored. The researchers then suggest the viewer consider the perspective of nodes that are not colored, under the first scenario—any of them will see whatever message is being given by one of the more popular (red) nodes—and that is where the illusion occurs. In the real world, it appears possible that such networks would allow something to seem much more popular than it really is, because it is being disseminated by just a few well-connected nodes, whether it is a video of a cat doing something stupid, or a minority opinion about a well known topic. Social behaviors are often contagious, spreading through a population as individuals imitate the decisions and choices of others. A variety of global phenomena, from innovation adoption to the emergence of social norms and political movements, arise as a result of people following a simple local rule, such as copy what others are doing. However, individuals often lack global knowledge of the behaviors of others and must estimate them from the observations of their friends' behaviors. In some cases, the structure of the underlying social network can dramatically skew an individual's local observations, making a behavior appear far more common locally than it is globally. We trace the origins of this phenomenon, which we call "the majority illusion," to the friendship paradox in social networks. As a result of this paradox, a behavior that is globally rare may be systematically overrepresented in the local neighborhoods of many people, i.e., among their friends. Thus, the "majority illusion" may facilitate the spread of social contagions in networks and also explain why systematic biases in social perceptions, for example, of risky behavior, arise. Using synthetic and real-world networks, we explore how the "majority illusion" depends on network structure and develop a statistical model to calculate its magnitude in a network. No real discovery. The scammers have been doing it for ages. The societal principle that, for the morons, position, popularity, influence, general approval,, money make for truth. And, if what they say doesn't work out, it's someone else's fault, not the powerful or popular liar's. Popularity, position, money are surrogates for truthfulness, a surrogate for those is a lot of letters after your name, even if they are not legitimate. Which is why, someone in a lab coat holds up a molded resin cast, declares that it is a "fossil" and, despite their insistence of demanding proof, "science" devotees declare absolutely that that proves "evolution". Add another mechanism, the desire of certain malingerers to play superior to others. Play to their grandiose narcissism and they'll follow you willingly. And don't forget the manifestation, too, that there are those who want to think like the mob, not go their own way. The ancient quote says: " I sing a song of whose bread I eat" is the essence of popularity if extended to other than needs of subsistence. It deeply touches fundamental mechanism of socio-political power i.e. command and control over larger society . It forces so called "rational" or consistent behavior in insane context of magical thinking about bogus cause and the illusory effect of mental benefit of belonging or acceptance. Popularity is the reverse side of a coin of alienation. In scientific context it relates to the fundamental issue of modern (from XVI century on) science; intelligibility or believability of scientific claims and interpretation of experiments. Numerous examples one can find to see how so-called established "scientific" authority imposed adoption of specific, false interpretations of experimental results, and socially enforced it. Actually I thought this was describing the media in the hands of the elite. Or sour grapes from the right wing, as well as anti-pot groups.